EventScope's software was similar to, but predated, Google Earth, but primarily presented Mars datasets. 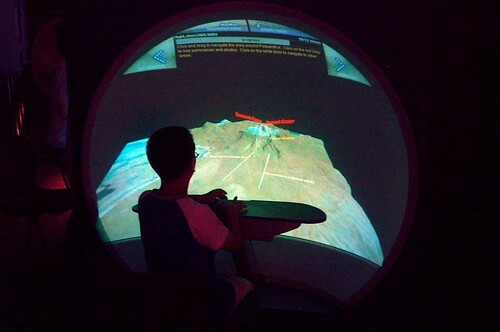 It was a reconfigurable client-server software system that enabled the rapid generation and dissemination of “guided tours” through 3D virtual environment terrains constructed from NASA rover and orbiter data. EventScope's software was used by educators, artists, and scientists, to develop dozens of multimedia experiences that presented NASA data to hundreds of K-16 educational environments (e.g., schools and science museums). 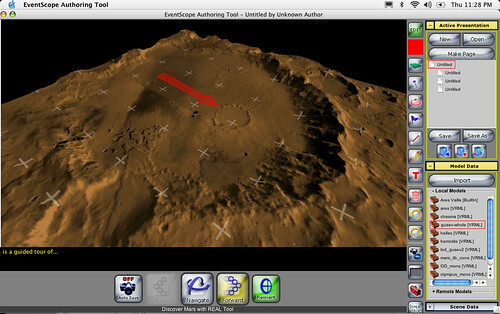 A version of EventScope was adapted and used for the science operations interface for the 3-year NASA/CMU Life in the Atacama rover field experiment. 4. 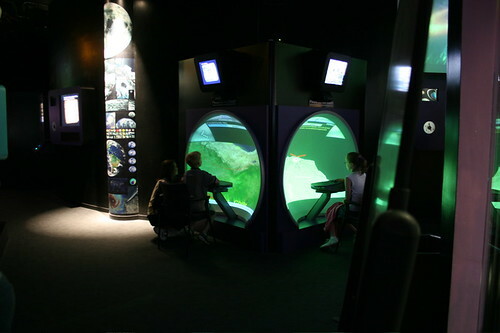 The EventScope Museum Viewer was designed for Elumens VisionStations at the Adler Astronomy and Science Museum in Chicago. 5. At the Adler, in Chicago. 6. 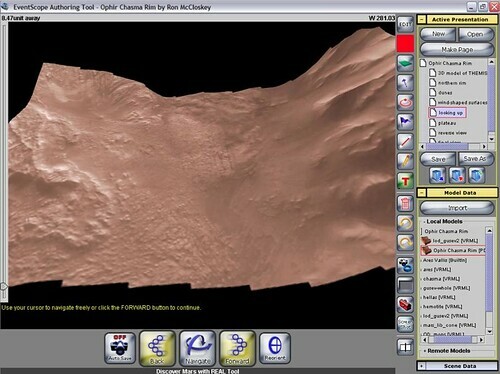 A Mars terrain constructed out of data fused from multiple sources, prior to being annotated for an educational guided tour. Myers, E., Coppin, P.W., Wagner, M., Lu, L., McCloskey, R., Seneker, D., & McCloskey, K. (2005, October). The EventScope remote science operations tool: Using a visualization of a remote location as an interface for robotic exploration. In proceedings of the IEEE Visualization Conference 2005 (VIS 2005). Minneapolis, MN: IEEE. Thomas, G., Coppin, P.W., Cabrol, N., Wettergreen, D., Pudenz, E., & Glasgow, J. (2005). Collab- orative virtual environments for control of planetary exploration rovers. In proceedings for special Session on Human Robot Interaction, Human Computer Interaction / Virtual Reality Conference 2005. July 22-27, 2005, Las Vegas, NV. Myers, E., Coppin, P.W., Wagner, M., Fischer, K., Lu, L., McCloskey, R., Seneker, D., Cabrol, N., Wettergreen, D., & Waggoner, A. (2005, March). Using near real-time mission data for education and public outreach: Strategies from the life in the Atacama E/PO effort. In Proceedings of the 36th Lunar and Planetary Science Conference (LPSC 2005). League City, TX. Myers, E., Coppin, P.W., Wagner, M., Fischer, K., Lu, L., McCloskey, R., & Seneker, D. (2004). EventScope: Bringing remote experience of Mars to the public through telepresence. In Proceedings of 10th Symposium on Information Visualization 2004 (InfoVis 2004) , October 2004, Austin, TX. IEEE. Coppin, P.W., Fischer, K., Koch, N., Martinelli, D., McCloskey, R., & Wagner, M. (2002). 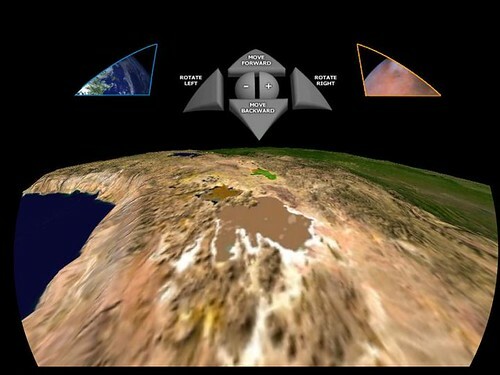 EventScope: Discovering Mars with internet-based virtual environments. In proceedings of ACM SIGGRAPH 2002. July 2002, San Antonio, TX: ACM. Coppin, P. and Fischer, K. (2002). Authoring tool for remote experience lessons. US Patent 7305611 B2. Coppin, P. W., Wagner, M. D., & Thayer, S. (2001, February). Reality browsing: Using information interaction and robotic autonomy for planetary exploration. In M. S. El-Genk (Ed. ), American Institute of Physics Conference Series (Vol. 552, pp. 64-69). Albuquerque, NM. Coppin, P.W., Pell, R., Wagner, M., Hays, J., Li, J., Hall L., Fisher, K., & Hirschfield, D. (2000). EventScope: Amplifying human knowledge and experience via intelligent robotic systems and infor- mation Interaction. In proceedings of IEEE Robot Human Interaction 2000 (RO-MAN 2000) (pp. 292-296). Osaka, Japan: IEEE.